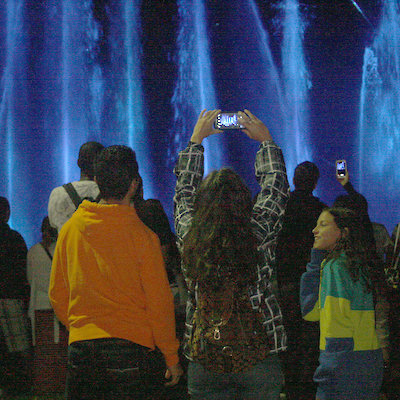 "Onguiraaha - Thunder of Waters, " a new outdoor sound and light show opened to rave reviews over the weekend. "This is going to blow people's minds," said Melissa Kate, a jazz musician from Buffalo, N.Y., who often performs in Niagara. "I learned stuff and I know the Falls." Niagara Falls started with "single drop of water" 12,000 years ago and it will end the same way 50,000 years from now, according to a new "sound and light show" being staged until September 1st. in Queen Victoria Park. The Onguiraahra show takes its name from the Iroquois word for the Niagara River which means "thundering waters," debuted over the weekend. You'll learn more in 15 minutes about what "one drop of water" can do than you ever expected and you'll be entertained doing it. Onguiraahra is staged from a temporary fountain - about the size of a hockey rink - that has been set up in the same park area that's used for the annual New Year's Eve concert, opposite the American Falls. Standing within throwing distance of the Niagara River is the perfect setting to learn about water - "one of the most powerful forces in nature" - and how it shapes the geography that surrounds us. "Water always goes where it wants to," the show's recorded narration ominously says. A mist created by jets serves as watery movie screen as images are projected onto it. Then the fountain sprays columns of water approximately 10 metres into the air. Coloured floodlights dramatically cast blue, purple and white hues over the fountain, contributing to the show's mysterious, alluring atmosphere. A soundtrack using low pulsating strings and a heavy repetitive drum beat builds tension and simulates the steady, powerful flow of the Niagara River itself. All the while, a narrator talks you through how Niagara Falls was created 12,000 years ago when a single drop of water decided to run downhill toward Lake Ontario and started carving out the Niagara gorge. As the show ends, the narrator forecasts a day 50,000 years from now when a single drop of water "will push the falls into oblivion, leaving just a river." This kind of sound and light show is a natural for Niagara Falls. In Ottawa, the National Capital Commission has used sound and light shows for years to tell the history of Parliament Hill. "We have an appreciation for what you're doing. We understand," Melissa Kate said, adding it will help educate people about the natural history of Niagara Falls. "That's nice... That's really cool," her musical partner Van Taylor said as the show ended. Taylor added, as musicians, they've travelled widely and have seen what word-famous cities like Paris have done to share their history with visitors. 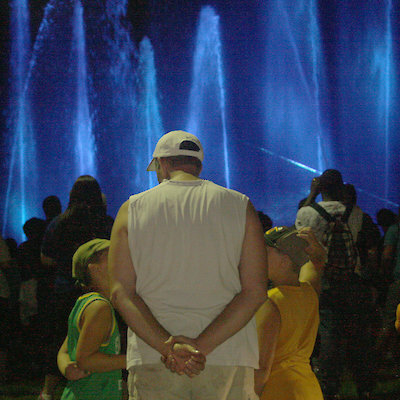 Onguiraaha - Thunder of Waters opened on Aug. 22 and is on until Sept. 1. It runs three times every night - at 815 p.m., 9:15p.m. and 10:15p.m. On Friday and Sunday night, the show was a warm-up for the thousands of people hanging out in Queen Victoria Park waiting for the 10 p.m. fireworks display.